The process by which cells copy their own chromosomes and then make new cells is vital to all of life. Chromosomes contain the genetic blueprint that makes us what we are and this information must be copied perfectly for new cells to survive and carry out their function. When the copying process goes wrong, it can lead to cancer as abnormal cells are created. Proteins in the cell combine to build a molecular 'machine' called the replisome, which plays a vital role in copying the double helix of DNA that is at the heart of each chromosome. The replisome is only built once during the life of each cell, and is then disassembled to ensure that cells just make one single copy of each chromosome. Professor Karim Labib and colleagues in the School of Life Sciences at Dundee had previously studied this process in yeast, which is just one cell and is much easier to work with than human cells. They have now found that things are more complicated in animals, which have at least two different disassembly mechanisms. Importantly, the gene needed for one of these processes is lost in a number of human cancers, suggesting a new approach by which these particular tumours could be treated. "Ever since Watson and Crick first described the structure of DNA we have known that cells copy chromosomes, but we are still learning how it works," said Professor Labib. "By looking at yeast, which is very similar genetically to humans, we discovered that one of the many components of the replisome undergoes a change called 'ubiquitylation', after the chromosomes have been copied, which marks the replisome for disassembly by the cell's recycling machinery. This is a good thing, as genetic studies show that if the replisome is not taken apart but instead remains glued to the chromosomes, then this can lead to major problems. "What we have now discovered is that the machinery that marks the yeast replisome for destruction doesn't exist in animals, so there had to be something else driving this process. By studying a small worm called Caenorhabditis elegans we found that animals actually have two different mechanisms for replisome dissassembly. If one pathway fails to do its job then the second kicks in as a back-up. "What makes this particularly interesting is that a gene required for the second mechanism is known to be mutated in a variety of human cancers, including some lymphomas, glioblastomas and myelomas. Our work with this gene in worms suggests a new way to treat the corresponding cancers in humans. "If we partially inactivate the genes involved in either the first or the second pathway for replisome disassembly then worms are fine, but inhibiting both at the same time is lethal. Translating this idea to humans, a drug that inhibits the first pathway should specifically kill tumour cells that lack the second pathway, without hurting the rest of the body." The work is another significant step towards understanding the processes at the heart of human cells, which is vital for developing new treatments to tackle diseases. In almost all instances of cancer development, errors in the chromosome copying machinery can be seen in the early stages. "One of the goals in cancer research is to understand the normal biology that goes wrong in cancer cells, because only then can we look for better ways to kill cancer cells without hurting the rest of our body," continued Professor Labib. "This area of chromosome replication has been of major interest for the last couple of decades, as we uncover more and more about how it works. 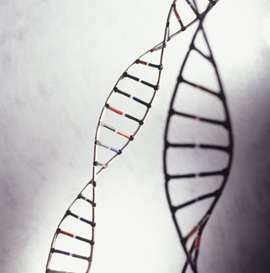 "Copying chromosome badly leads to mutations and mutations lead to cancer. Cells divide when shouldn't and lose identity, leading to them breaking off and floating round our bodies in blood and the lymphatic system metastasis occurs. "The challenge in treating cancer is to find a way to kill part of you without killing all of you. The goal is to find cleverer forms of chemotherapy that kills cancer cells but not healthy ones. The problem is that have the same DNA, as you so what we need to do is find out what makes them different and target any Achilles heel we think we can find." The paper is published in the latest edition of the journal Nature Cell Biology.